A policeman stands guard at the site of a suicide attack in central Kabul, Afghanistan, Oct. 31, 2017. 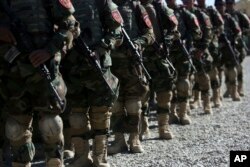 The government of Afghanistan's territorial control has declined to its lowest level in two years while battling a resurgent Taliban insurgency, a U.S. government watchdog revealed Tuesday. In its quarterly report submitted to Congress, the Special Inspector General for Afghanistan Reconstruction (SIGAR) noted 56.8 percent of the country's 407 districts are under government control or influence as of August, 2017. The assessment shows a 15 percent decrease in territory held by Kabul in 2015 when SIGAR began analyzing district control data. "As of August 2017, there were 54 districts [13.3 percent] under insurgent control  or influence , an increase of nine districts over the last six months," the agency said. Citing U.S. military assessments, it added that 11.4 percent of the country's population, or 3.7 million Afghans, now live in districts under insurgent control or influence. That's a 700,000-person increase over the last six months. SIGAR reported that 30 percent or 122 Afghan districts are contested, and the statistic remained mostly unchanged. "It was not clear whether these districts are at risk or if neither the insurgency nor the Afghan government exercises any significant control over these areas," it said, citing U.S. military assessments. The Taliban also claims it captured several Afghan districts in October and has been inflicting heavy casualties on Afghan forces since launching its so-called "Mansouri" spring offensive this year. While Afghan forces lost nearly 7,000 personnel in the first 10 months of 2016, the figures reportedly are much higher this year. The U.S. agency noted more than 60 percent of the roughly $121 billion in U.S. funding for reconstruction in Afghanistan since 2002 has gone to build up the Afghan forces. Also, the increased classification of Afghan forces' data will "hinder SIGAR's ability to publicly report on progress or failure in a key reconstruction sector." In its latest report, SIGAR said Washington has agreed to classify data on the number of Afghan forces killed and wounded in the conflict. It quoted the U.S. military as telling the agency "the casualty data belonged to the Afghan government, and the government had requested that it be classified." American combat casualties also are rising with the increase in U.S. troop commitment to the Afghan mission, according to SIGAR. Within the first eight months of this year, it noted, 10 American soldiers were killed and 48 were wounded. That is double the personnel killed in action when compared to the same periods in 2015 and 2016. New members of the Afghan Special forces attend their graduation ceremony at the Afghan Corp, on the outskirts of Kabul, Afghanistan, Oct. 25, 2017. The watchdog also has reported a spike in "insider attacks" since the beginning of 2017, targeting both U.S. and Afghan forces. They are incidents involving renegade or pro-Taliban Afghan soldiers who turn their guns on colleagues or American partners. U.S. military commanders hope President Donald Trump's new Afghan strategy that was unveiled in August will help Afghans reverse insurgent battlefield gains. Washington has since taken on a greater combat role in Afghanistan, dropping 751 bombs against the Taliban and Islamic State in September, the highest monthly munitions since 2012, and conducting a record 2,400 airstrikes in the first nine months of 2017, according to SIGAR. The intensified conflict also has led to a record increase in Afghan civilian casualties this year, warned the United Nations Assistance Mission in Afghanistan, or UNAMA. The mission documented a 52 percent increase in civilian casualties from Afghan coalition air operations in the first nine months of 2017, compared to the same period last year. More than two-thirds of these victims reportedly were women and children. UNAMA attributed 177 or 38 percent of all civilian casualties from airstrikes to International military forces, although U.S. military disagreed with the assessment and methodology, offering instead that it had confirmed 43 civilian casualties caused by international airstrikes during this period, noted SIGAR in its report.